In the first half of the nineteenth century, the introduction of telegraphy, the development of a cheaper and more reliable postal service, the rise of the mass-circulation press, and the emergence of the railway dramatically changed the way people communicated and experienced time and space. Concurrently, photography developed as a medium that changed how images were produced and circulated. Yet, for the most part, photography of the era is studied outside the field of media history. The contributors to this volume challenge those established disciplinary boundaries as they programmatically explore the intersections of photography and “new media” during a period of fast-paced change. Their essays look at the emergence and early history of photography in the context of broader changes in the history of communications; the role of the nascent photographic press in photography’s infancy; and the development of photographic techniques as part of a broader media culture that included the mass-consumed novel, sound recording, and cinema. 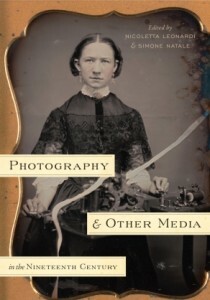 Featuring essays by noteworthy historians in photography and media history, this discipline-shifting examination of the communication revolution of the nineteenth century is an essential addition to the field of media studies. In addition to the editors, contributors to this volume are Geoffrey Batchen, Geoffrey Belknap, Lynn Berger, Jan von Brevern, Anthony Enns, André Gaudreault, Lisa Gitelman, David Henkin, Erkki Huhtamo, Philippe Marion, Peppino Ortoleva, Steffen Siegel, Richard Taws, and Kim Timby.